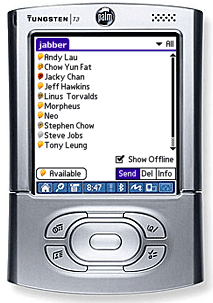 Chatopus is a Jabber/XMPP client for instant messaging (IM) on the Palm OS platform. The client adds feature-rich instant messaging and presence functionality to Palm devices, enabling Palm users to instantly communicate to other wireless and wired users. Chatopus allows users to communicate with Jabber contacts. What's more, it also supports the transport aspects of Jabber, allowing users to establish links to other instant messaging solutions including MSN Messenger, ICQ, AIM, Yahoo! Messenger, GaduGadu, Sametime and others. Chatopus can also be used to receive real-time news via RSS feeds.